If you follow me on Instagram you might have seen my new concept Make Eat Explore. 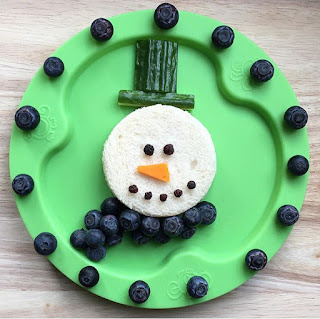 Every week I’ll be showing you fun ways to incorporate the weekly theme into food art and activities. So the first theme is winter. Let’s face it winter can be a bit of a drag, it’s cold, it’s dark early and everyone’s skint after Christmas! So these ideas are simple ones you can do at home without having to buy lots of resources - just adapt to what you have already. When it comes to creating food art I always try to keep it easy so that it is easy for you to replicate but one thing that might come in handy is some snowflake cookie cutters. 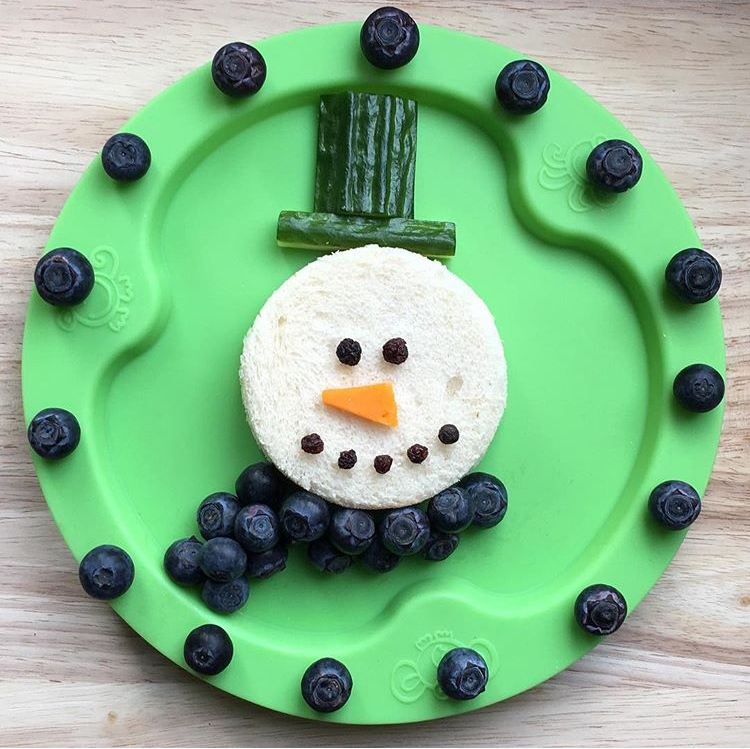 To make a snowman sandwich just cut out two circles of bread. Add your filling on top of one circle then place the other on top. I added raisin eyes, cheese triangle nose and raisin mouth. I included a blueberry scarf and cucumber hat. These are completely adaptable though. I’ve also made a two tier snowman sandwich this time including a strawberry hat and orange pepper nose. I love this one! It was really easy too. Just make up porridge then add to a bowl. Add blueberries around the edge and bring in at the top to form a v shape. I added raisin eyes and a triangle piece of cantaloupe for a nose. Okay so this one is only easy if you have snowflake cookie cutters but as you can see it’s worth the investment. Cut two pieces of bread using the cutter then place a smaller cutter on top of one slice to act as a window. This has to be the easiest creation and definitely one to try if you are not confident with food art. Simply spread soft cheese onto a slice of toast then add banana ears and nose. Add blueberries for eyes and to top onto the banana. You could easily do this with an English muffin or even a rice cake. 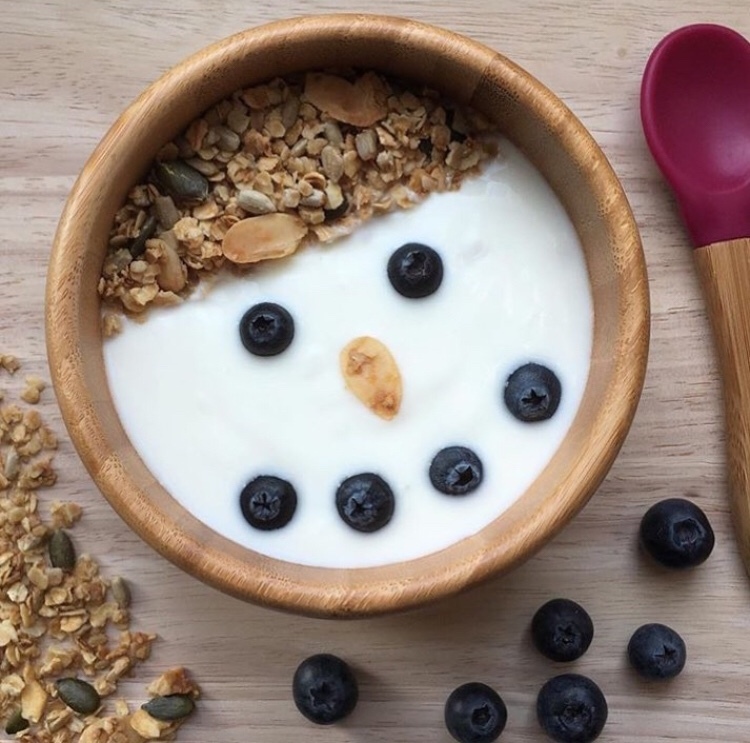 If you have some granola why not make it into a snowman bowl. Add white yogurt into a bowl. Add the granola to the top to create a hat. Underneath add blueberry eyes, almond nose and blueberry mouth. To make granola check out my really easy recipe here. 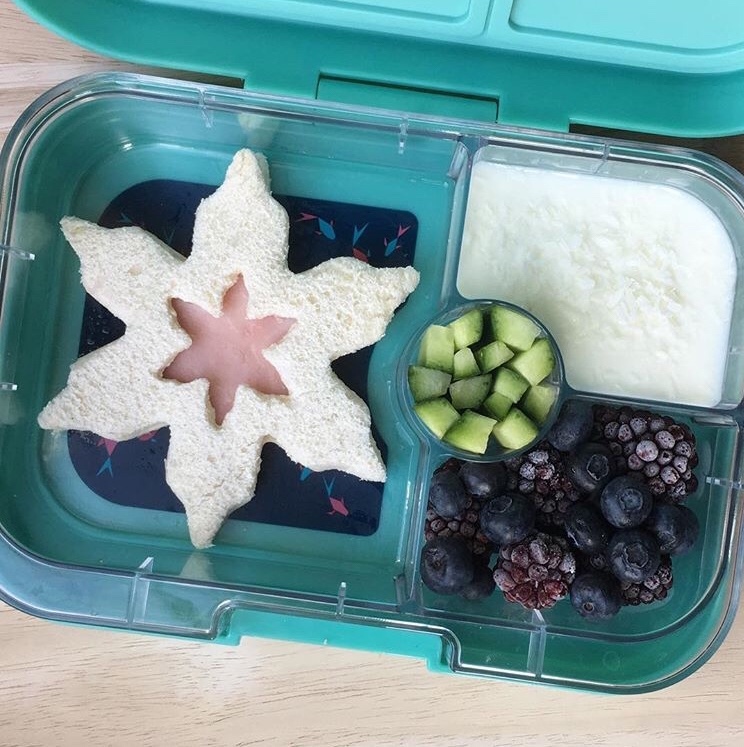 This was inspired by Eats Amazing featuring our Yumbox. Using two slices of 50/50 bread (you could use whole meal bread) cut two large circles in each slice. In one of the circles cut a smaller circle out for the penguins tummy. In one slice of white bread cut a smaller circle. Make your sandwich and add the smaller white circle to the gap in the bigger brown circle. I added edible eyes but you can replace with raisins or blueberries. I added a cantaloupe and cantaloupe feet made circular with a cookie cutter. You could perhaps use some satsuma instead. These are just some ideas to get you started but the options are limitless. 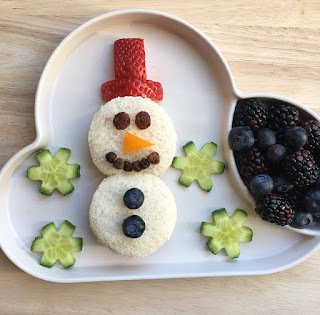 How about a rice cake snowman or a penguin granola bowl? Do you have a baby at home and want to get them involved, then sensory bottles are ideal. You can fill them with whatever you like. 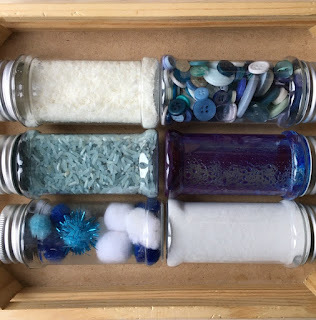 We’ve got some buttons, salt, coconut, pom poms, baby oil with food colouring and some dyed rice. I like to include different sounds for shaking. 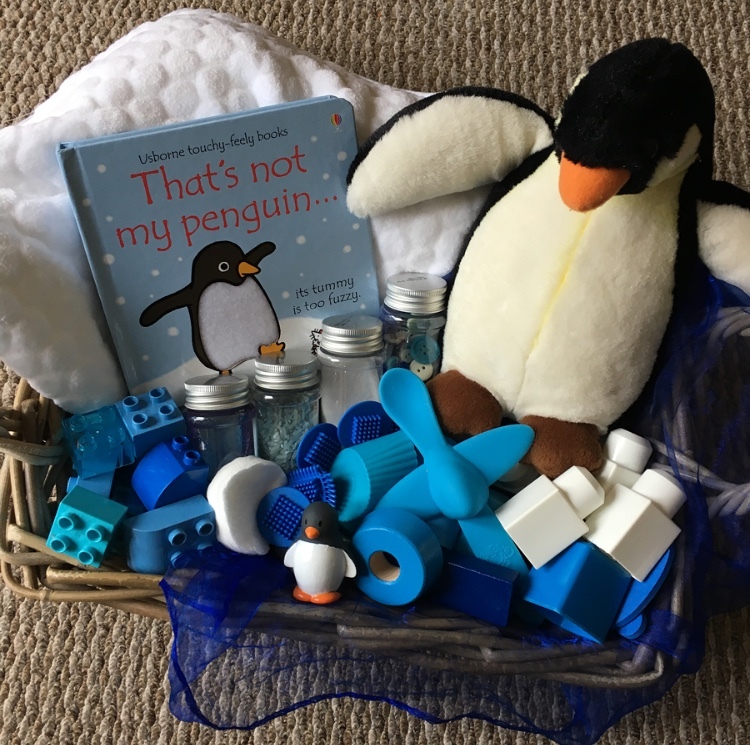 We love story baskets and they are a regular feature in our play. You don’t even need a basket you could use a story bag, box or tub. I just find bits and pieces from around the house that I can use to tie in with the theme/story. I try to include lots of different textures and shapes. I also included the sensory bottles I made. I set this up as an after school activity for my older children (4 and 7). 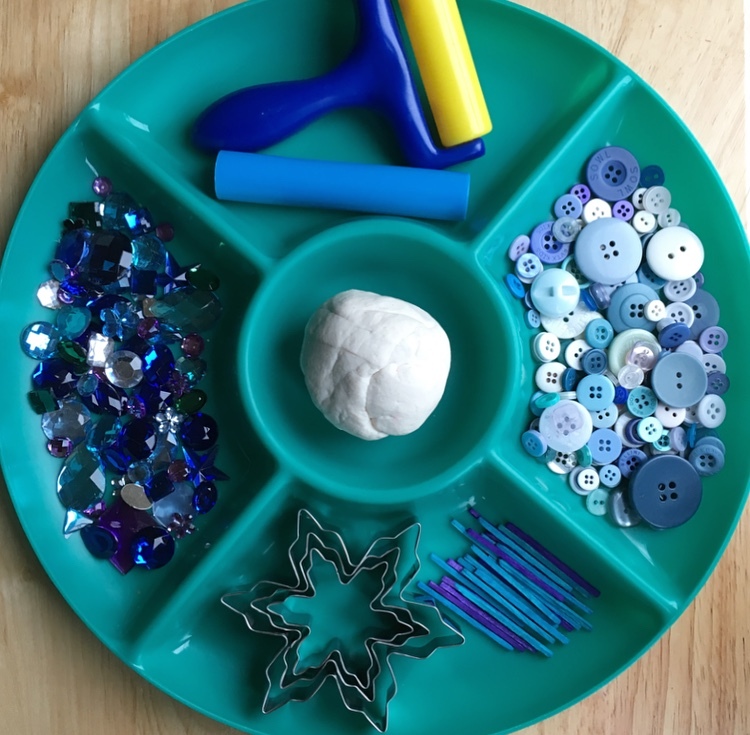 I set up a tray with white play-doh, snowflake cookie cutters, rollers and some things to decorate them with. It was perfect for working those little hands to improve hand strength. I love sensory boxes and do them regularly with my older children. This is the first time I had done one with my toddler (16 months). I wanted it to be taste safe so I used oats instead of trying to make it look more wintery. You could use flour or rice instead if your child is less likely to put it in their mouth. 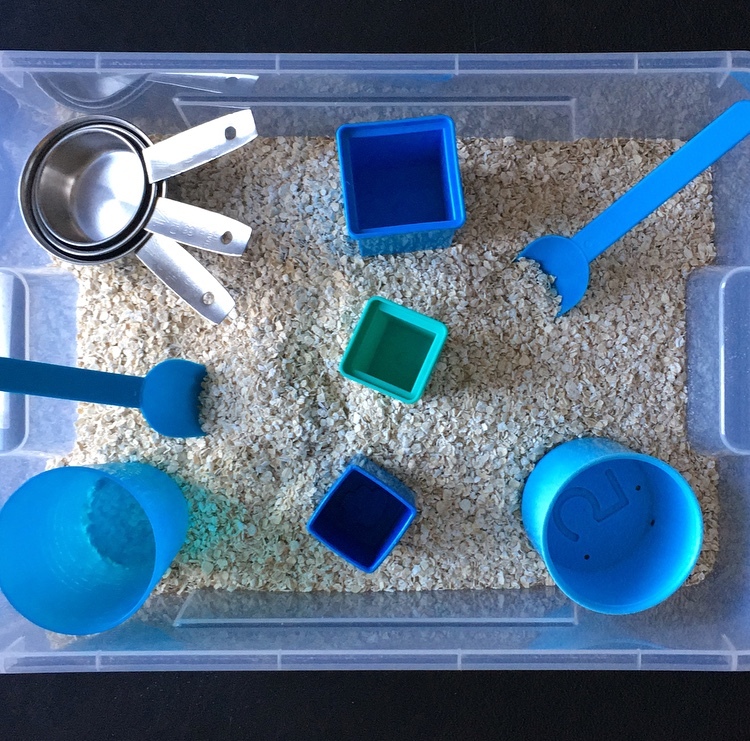 I filled a tub with oats and then just put some blue/white tubs, cups and spoons in it to help her explore. As this was her first time she was just quite happy to explore the oats with her hands (and mouth). I did leave this out for my older children to play with after school but just added a few more tools. For these activities I always use a tuff spot tray as they are so handy for keeping the mess contained. 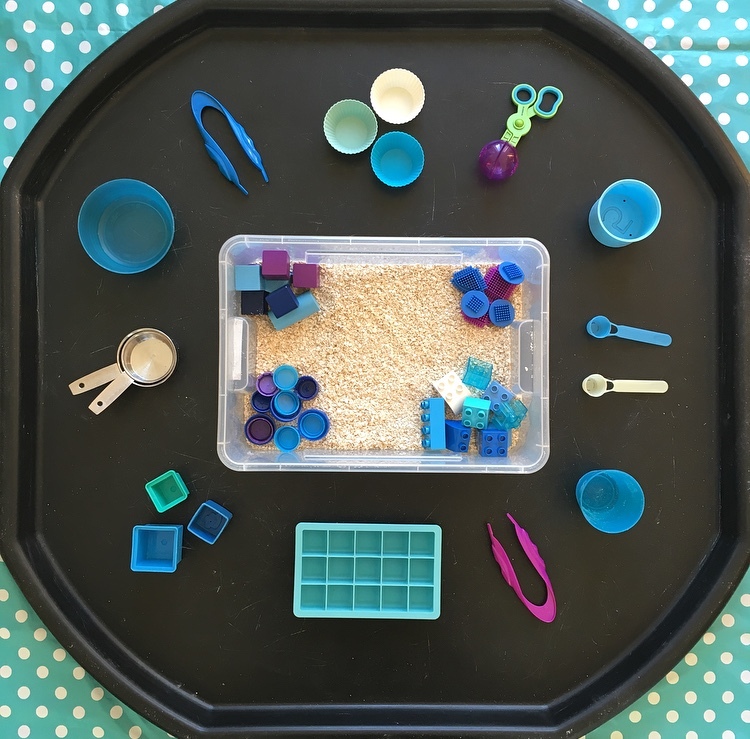 This activity took less than 2 minutes to set up and was a huge hit. I just sprayed some cheap shaving foam onto our tuff spot tray and then added some diggers. The clean up was easy too as I just hosed down the tuff spot outside. 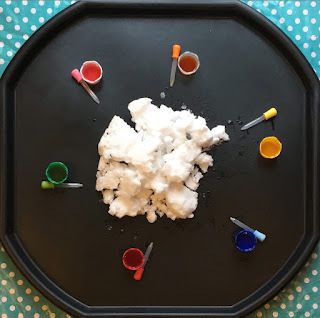 I did this activity with my older children only. They loved playing with the trucks and also the touch of the shaving foam on their hands. We even practiced some school spellings! I used the tuff spot tray to set up a winter exploring activity. I used a book about seasons and then just added different bits and pieces for her to explore. I’ve used the sensory bottles and bits from the story basket but just presented them in a different way. I also included a zip lock bag snowman filled with shaving foam for her to poke, squeeze and move. If you have been lucky enough to have some snow maybe you could try one of these ideas that we did last year. 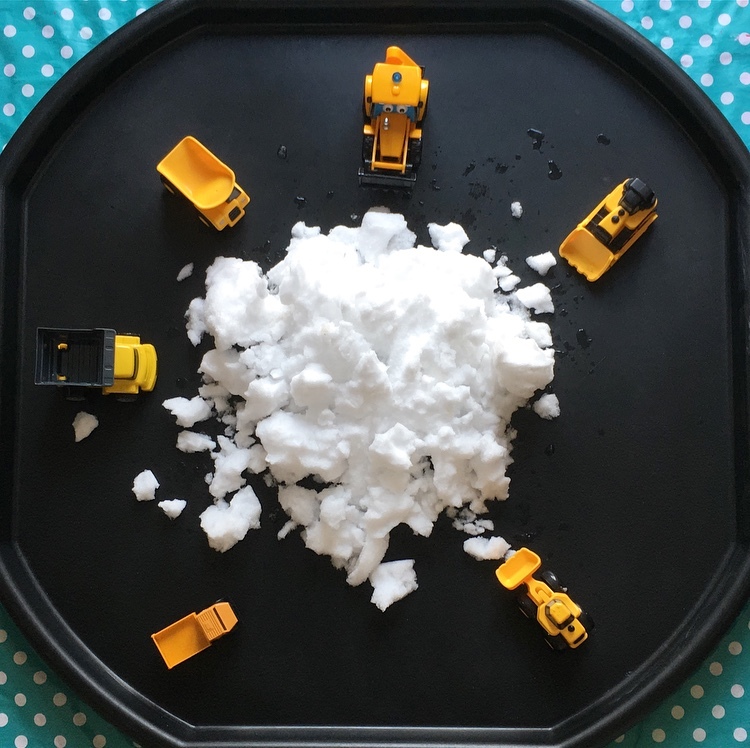 A really quick activity to set up, just bring some snow inside and place it in a box or tuff spot, add diggers and then you're ready to play. You could add some stones, pine cones or sticks but I kept it simple. I filled some tubs with water and food colouring and then placed droppers next to them. If you don't have droppers perhaps you could use medicine syringes that I bet you have lying about in a drawer somewhere. You could do this either inside using a tub or tuff spot or outside if you are braving the cold. 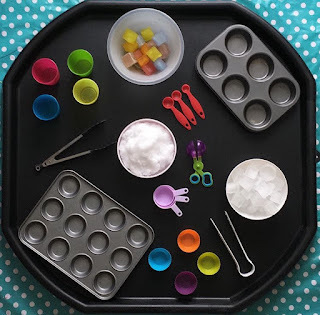 Using some muffin tins and kitchen items I set up this snow kitchen. I included some snow from outside and ice that I had dyed with food colouring but that is completly optional. I hope you’ve found these ideas helpful for some winter themed fun. What would you like to see as a future theme? Disclaimer - I have included links to products that contain affiliate links so I may earn a small commission on any purchases at no extra cost to you.